Tracks in the snow | Reading. Running. Knitting. Last week, as I headed out for a run, there was a dusting of snow on the ground. It was my third run that week, I was feeling good, and I ready to do a nice 5km run. The whole time I was out, snow was gently drifting down. It was only -2 or -3°C, and there were very few people out, and I didn’t hit any traffic lights, and it was bright and beautiful out. When I was coming back to my house, I saw my tracks from the way out in the snow on the path. There were boots and running shoes, and then there were mine, that looked like footprints. 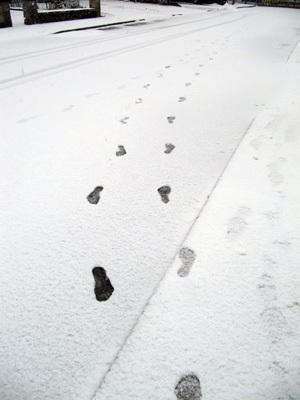 And I thought of the other people who had gone along that path, and wondered if they’d noticed, and thought that there was someone out there, wandering barefoot on a snowy Friday morning. 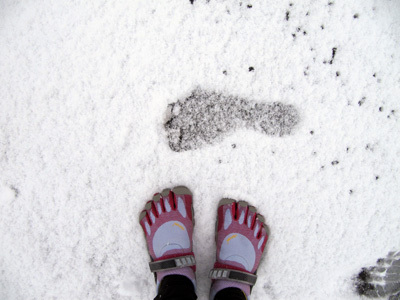 This entry was posted in running and tagged running, snow. Bookmark the permalink.